No one knows interior design like MyBespokeRoom.com, so we asked them to tell us what trends homeowners can expect to see in 2019. We believe at My Bespoke Room that classic colours are certainly not going away (we all still love whites and greys) but we’re also loving less traditional neutrals. In particular, the colour green as seen on this bedroom wall. It works to bring a moody feel to any space but doesn’t feel overwhelming at all. This master bedroom remains bright and sophisticated, boasting a Farrow & Ball Studio Green wall and pastel soft finishing touches. Shades of dusty pink lift the moodiness of the deep green, creating the perfect balance. Throw in some brass finishes and you’re bang on trend. We’ve also noticed a lot of bright bold jewel tones popping up. Think colours inspired by travels to India and Morocco – super saturated and rich like in this small bathroom. A feast for the eyes! Modern furniture isn’t a new thing, but we think shapes are moving up a notch on the boldness scale this year. Curvilinear shapes influenced by Italian modernism and retro futurism are already starting to appear. We love Swoon Editions for affordable pieces that have stand out with beautiful shapes. Big leafy plants and cute little succulents are on the rise, and we don’t see them going out of style any time soon. It’s amazing how much a pop of green can completely transform to a room. 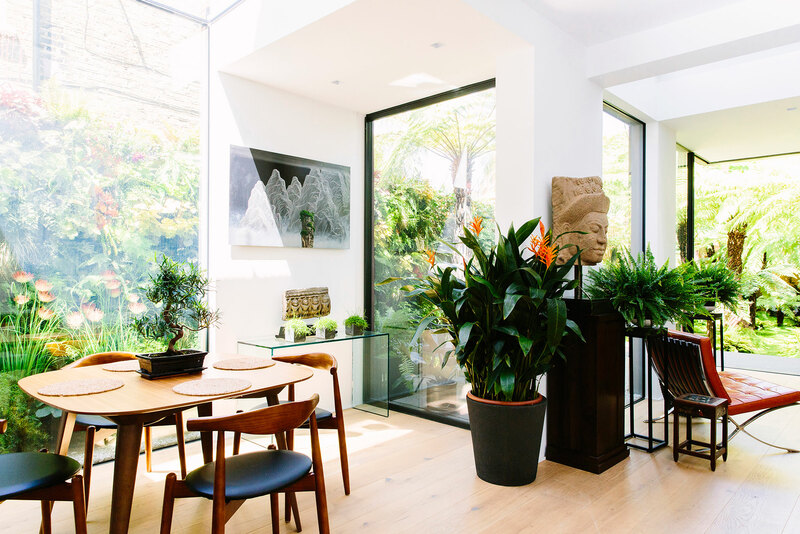 Large, leafy plants can add life to a dull corner and make an empty space feel complete. There are also health benefits by incorporating greenery into your home. They improve breathing, purify the air, decrease anxiety and sharpen focus to name just a few! While these look beautiful in a traditional setting, we’ve noticed a lot popping up juxtaposed with more modern pieces and settings for an eclectic look.